A determined Keynsham schoolgirl has raised thousands of pounds for charity after bravely having her hair shaved off – as dozens of family and friends cheered her on. Nine-year-old Sophie Lowe invited supporters to a fundraising evening at Keynsham Cricket Club on Friday, August 1, to watch as her long blonde hair got the chop. 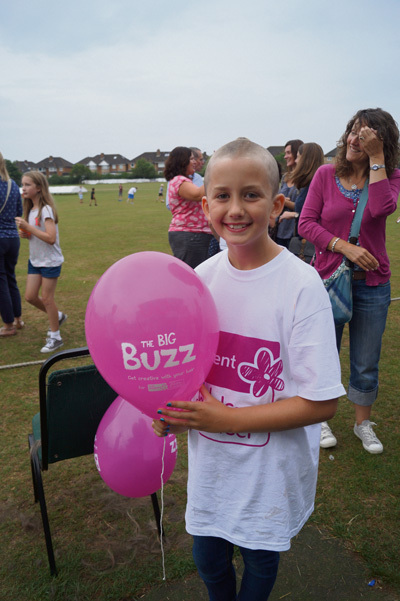 The Saltford Primary pupil was hoping to raise £1,000 for young people’s cancer charity Clic Sargent when she first launched her Sophie’s Big Buzz appeal. But with sponsorship pouring in from everyone from classmates to complete strangers who read of her brave gesture in Keynshamvoice she has now collected more than £2,500. 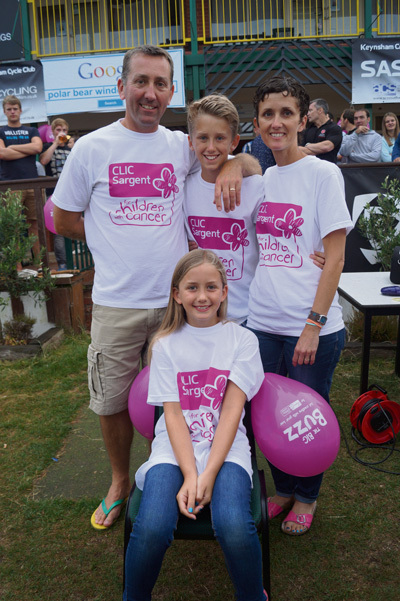 Sophie’s mum Abi, dad Nick and older brother Sam proudly looked on as she didn’t even flinch when her plait was cut off before hairdresser Helen Gray took out the clippers. Answering “yes” with a laugh when asked if she was absolutely sure she wanted the dramatic haircut, her audience clapped and cheered as the rest of her hair was shaved off. Making a speech to the crowd after, dad Nick thanked everyone who had supported Sophie and given donations large and small: “This is such a headstrong thing to do and we are so proud as a family, Sophie has raised an amazing amount for charity, especially for a nine-year-old. And as if raising more than £2,500 wasn’t enough, Sophie will also be helping a second charity. The plait she had cut off is now on its way to the Little Princess Trust where it will be made into a wig for a young cancer patient. Donations can still be made online at www.justgiving.com/Sophielowe-bigbuzz/.